Product Description: In 1964, Chrysler gave the world a glimpse of the future. They built a fleet of turbine cars--automobiles with jet engines--and loaned them out to members of the public. The fleet logged over a million miles; the exercise was a raging success. These turbine engines would run on any flammable liquid--tequila, heating oil, Chanel #5, diesel, alcohol, kerosene. If the cars had been mass produced, we might have cars today that do not require petroleum-derived fuels. The engine was also much simpler than the piston engine--it contained one-fifth the number of moving parts and required much less maintenance. The cars had no radiators or fan belts and never needed oil changes. Yet Chrysler crushed and burned most of the cars two years later; the jet car's brief glory was over. Where did it all go wrong? Controversy still follows the program, and questions about how and why it was killed have never been satisfactorily answered. 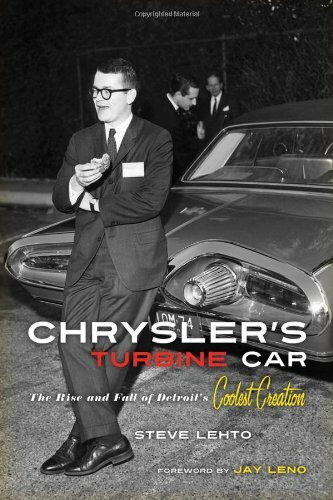 Steve Lehto has interviewed all the surviving members of the turbine car program--from the metallurgist who created the exotic metals for the interior of the engine to the test driver who drove it at Chrysler’s proving grounds for days on end. Lehto takes these first-hand accounts and weaves them into a great story about the coolest car Detroit ever produced.